From the kitchen of One Perfect Bite...It was a busy day. 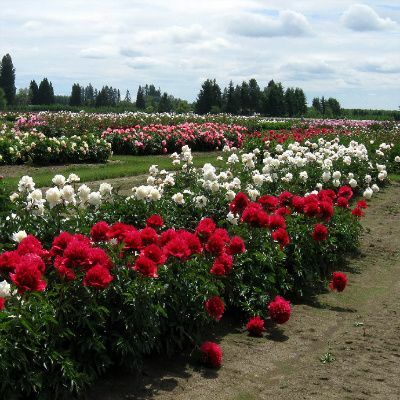 Commercial growers in our area open their fields and display gardens to the public at this time of year. 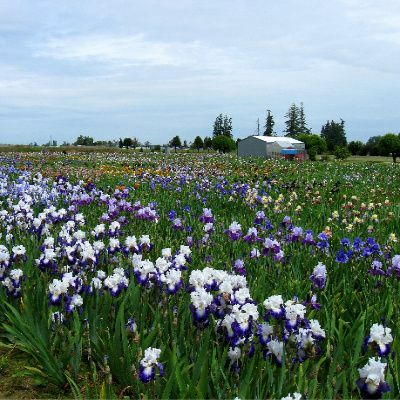 We spent the day touring acres and acres of peonies, iris and hostas and, when the crowds became too much, enjoyed the respite of the grower's gardens. A few peeks at the fields and gardens follow today's recipe. 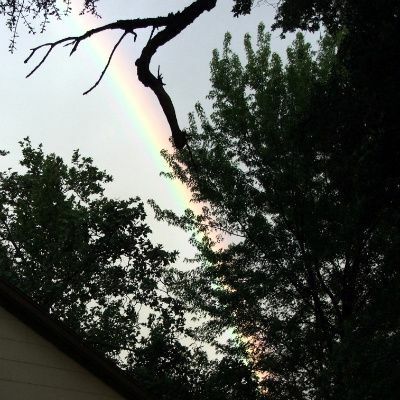 A brief sunshower, called a "monkey's wedding," dampened our clothing but not our spirits and the reward for our good nature was the promised rainbow. Dinner, which came from the freezer, was a late affair of tomato soup and blue cheese bread. The combination goes extremely well together and I thought those of you who love blue cheese might want to try the bread. It is much like a garlic bread or ripped baguette and is really easy to make. Here's the recipe. 2) Combine butter, blue cheese, Parmesan cheese chives and garlic powder in a small bowl. Mix well. Cut bread into 1-inch slices but leave slices attached at bottom of loaf. Spread cheese mixture between slices. 3) Wrap loaf in a large piece of heavy-duty foil. Fold foil around bread and seal tightly. Bake for 20 minutes or until heated through. Serve warm. Yield: 10 servings. I am totally into your blue cheese kick! I just came home with a costco size ammount! We generally add blue cheese to our beef burgers- I love a runny soft cheese with my turkey burgers. The idea of adding the blue cheese to the onions makes so much sense I am jealous I didn't think of that myself! I also like the idea of the blue cheese bread- Often I make a bagguette dinner which involves cutting the bagguette and adding topping that would cover all the food groups and make everyone 'happy'. Blue cheese makes 3 out of 4 of us happy. 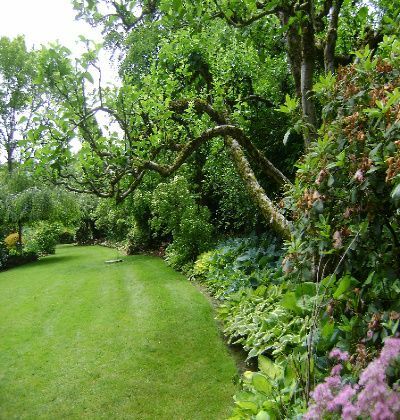 Lovely garden photos as well. This is a stunning way to start the wek Mary. Thanks for sharing these gardens and the piece de resistance..blue cheese breas. I really like this idea. Blue cheese bread!! Why didn't I think of that!? 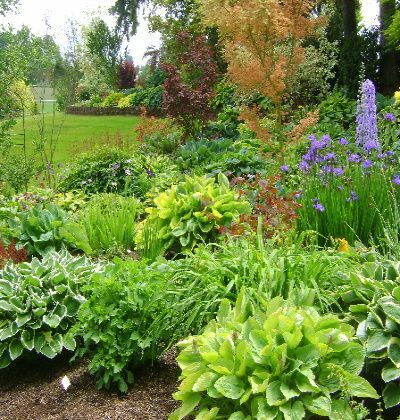 These garden pictures look beautiful! Oh the gardens are lovely! The recipe sounds devine. However, there's no way I will have the oven on while it's 85 degrees out, I will keep this recipe for the future cool down! The pictures are beautiful and I have a friend who loves blue cheese...I'm going to forward this link to him...also loved the info about the "monkeys wedding"...in the south, we call it something different-and it was on the link you provided. It was neat to find out where the saying came from and that there are different ones all over the world! Ciao Mary allthes plants are wonderful as your bread ! Wow Mary - what a beautiful way to spend the day! I don't know that I could have left gardens and fields like that. I'd have still been there when the stars came out. My father is a huge blue cheese lover. I think I may try this for him for Father's Day - thanks! mouthwatering indeed. thanks for sharing! 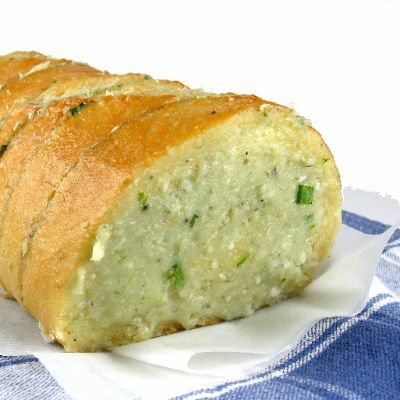 What a lovely blue cheese bread. I bet it tastes sooo good! What a great idea. I can't wait to try this! Oh Mary! Off to dig out the blue cheese! And the pictures are gorgeous!! Love the garden pictures. And the bread sounds sensational! What a lovely combination, Mary. Tomato soup and your blue cheese bread. I bet it's divine for a fresh tomato sandwich too. I am copying this now...and plan to do excactly that with it! And some arugula. I can practially taste it! I love this blue cheese riff on garlic bread! Looks like the perfect way to end a fun weekend. Those pictures are gorgeous! The bread looks totally delicious and the flowers are stunning in their lovely array of colour. I love blue cheese and this bread must be outstanding!! These garden pics looks beautiful and the blue cheese bread looks yumm! I'm not a huge fan of blue cheese, but this bread looks good. The garden photos are fantastic! Love the rainbow! Love blue cheese...I've got to try this! You've got a blue cheese theme going. Keep it up! I gotta get to the store to get some and try these recipes. I've made Swiss Cheese Bread for years - swiss, lemon juice, butter & poppyseeds between slices of baguette. Delish with a glass of white wine. Ciao Mary! ottimo questo pane...ma non ho capito che tipo di formaggio è il formaggio blu. I've taken a note of the recipe, that sounds like just the sort of thing my husband would love. Mary really nice pictures..hope u had a wonderful day visiting these gardens..
Mary, this looks magnificent! I've never tried Blue Cheese Bread before, but I'm sure I'll love it! What a wonderful way to spend the day. The flowers look terrific and I like the sound of anything with blue cheese. Mary - Your bread looks scrumptious but those gardens are sensational. Where are they? What gardens are they? I'd love to go see them myself.For Federica who wrote to you in Italian (I don't know if you speak Italian Mary) she wants to know what kind of cheese is blue cheese. Here's a reply if she's reading this: "Formaggio tipo blu e' come la gorgonzola." Those fields and gardens are just gorgeous! I love the idea of blue cheese bread - I do love blue cheese! Thank you for another great idea! 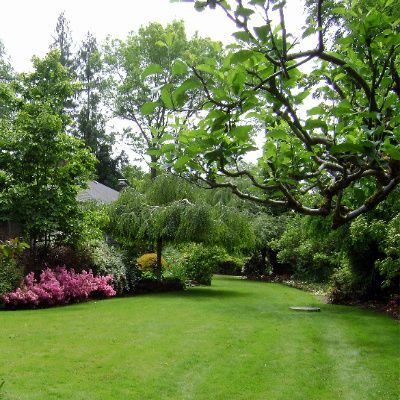 Howlucky you are to have such lush and beautiful gardens close by. I love peonies- so elegant. And the blue cheese bread sounds fantastic! I'll have to try this. I agree it sounds perfect with tomato soup. Looking at all of the gardens made me miss the Portland area. My daughter gets all of her veggies delivered to her door, fresh from the local area. Mary, I am in love with your blog!!!! Blue cheese bread...are you kidding me???? I love bread and I love blue cheese and you've gone and combined the two...I think I'm in love!!! I'm so following your blog...you've got some great recipes here! Thank you for visiting my blog...hope you'll be back again soon! I've always wanted to make some kind of bread with cheese. And this looks and sounds fantastic!! Your flower photos are lovely but your bread is even better! What can I say? It sound sjust incredible! I NEED to make this ASAP. Yum! These garden images are stunning. As for blue cheese, I used to hate it, until seriously about a month ago. Now I love it on everything. It's definitely an acquired taste to say the least! Great recipes for blue cheese here. Thanks! blue cheese bread?! yum! I wish I saw this before dinner I geuss it can wait for tomorrow. Hope you had a great weekend! Every time I read what you write about where you live it sounds like the most gorgeous place in the world. I would so love to spend a summer there to see. Just beautiful! And how I love blue cheese! What a great change from the old garlic and parmesan bread. Perfect with tomato or any other veg soup! Blue cheese bread sounds wonderful to me! Thanks for sharing those beautiful pictures. It still a great day to enjoy after all. Have fun! Have you ever tried Maytag blue cheese? I don't think it was created by the inventor of the Maytag dishwashers ... I think the Maytags left an endowment to Univ of Iowa and their ag department created the new version. Will have to look that up ... anyway, great photos! the pictures are beautiful and the bread sounds lovely. thank you for sharing the recipe! Thank you so much for the beautiful pictures. The big guy and I lived in Salem the first two years of our marriage before I let him talk me into moving to Tucson. Had I known about the peony gardens, I doubt he'd have won the discussion. Ha. Guess I need to buy some blue cheese with all the fabulous recipes you are posting. Delicious-looking bread and I am sure it was perfect with your tomato soup. Beautiful photos as usual! This bread looks so delicious! Those gardens are beautiful. We would so enjoy visiting them. The rainbow picture is amazing. I love blue cheese!!!! I love love love it!!! This looks divine and I will have to try it soon. The pictures of the gardens are stunning. I'm going to have to get to Oregon sometime. Oh yeah, and when I do, I'm stopping by for One Perfect Bite! Just like Babs I'm always looking for it.